The Chicago Architecture Center Auxiliary Board consists of architectural enthusiasts and design professionals interested in Chicago’s architecture. Founded in 1974, the Auxiliary Board supports the CAC by raising funds for teen programs. The board’s members also serve as cultural ambassadors who represent the CAC. The Auxiliary Board’s signature event is an annual River Cruise that has raised more than $300,000 for CAC programs. There’s no better place to be in the summer than Chicago, and every summer the Auxiliary Board River Cruise is the best party on the river. Every August, guests enjoy live music, gourmet food and drinks, and world-class architecture from an unmatched view as we take Trip Advisor’s Top Tour in Chicago and kick it up a notch. Funds raised during this event provide aspiring architects and designers the chance of a lifetime through the CAC’s teen programs. Each River Cruise has a theme; past ones included a Luau, the Sixties and Brazilian Samba dancing. The Auxiliary Board also creates opportunities for their members with access to some of Chicago’s most exclusive sites. Auxiliary Board events are held throughout the year in spaces that are often not open to the public. Past events have included receptions in newly constructed buildings, hardhat tours of historic renovations and a holiday parties in the homes of Auxiliary Board members. Are you passionate about good design? Auxiliary Board members love Chicago and want to see it grow in the best ways possible. Contact Donor Relations Coordinator Chris Younkin-Wilson at cywilson@architecture.org or 312.561.2153 for more information about membership. Purchase tickets to the Annual CAC Gala. Donate silent auction items for the Annual CAC Gala. Purchase tickets to other Auxiliary Board events. 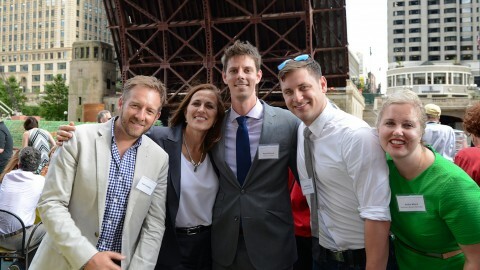 Make a charitable contribution to the Chicago Architecture Center. To learn more about the Auxiliary Board, please contact Chris Younkin-Wilson at cywilson@architecture.org or 312.561.2116. Enjoy special experiences exclusive to Auxiliary Board members throughout the year.